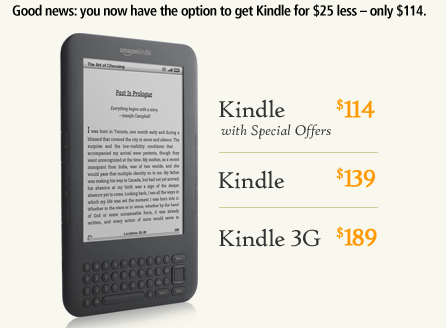 Amazon’s Kindle is about to become even more affordable. Today, the company announced that it’s releasing a new version of its popular eReader with a new feature that everyone will like: a price-tag that’s $25 cheaper than the Kindle Wi-Fi’s normal $139. But it comes with one minor catch: Amazon will be placing ‘Special Offers’ — also known as ads — into specific parts of the Kindle UI. But fear not, skeptical bibliophiles: Amazon says that the ads will only show up on the Kindle’s home screen and screensavers — they won’t appear when you’re actually reading. For those of you who haven’t used a Kindle before, the home screen is the menu where you select what content you’d like to read (you don’t see it often unless you frequently jump between books). And the screen savers show up whenever you put your device to sleep (on current models these include portraits of famous authors and art). In other words, the ads should be pretty unintrusive. The device, which runs $114, is available for pre-order now and will be released on May 3. To coincide with new Kindle, Amazon says that it will be launching a new application called AdMash (a possible nod to Mark Zuckerberg’s infamous Facemash), which will allow users to vote on the Sponsored Screensavers they like best. You’ll also be able to tell Amazon about your interests to get better-targeted ads (which I’m sure Amazon would love). In addition to more traditional ads, Amazon says it will be pushing “special offers directly on your Kindle”, including things like $10 for a $20 Amazon gift card, and $6 for 6 Audible books. This continues Amazon’s trend of dramatically slashing the Kindle’s price and releasing more affordable models— only a year ago the cheapest model was $259. Since then Amazon has released a Wifi-only version (which, at $139, is $50 less expensive than the 3G version). 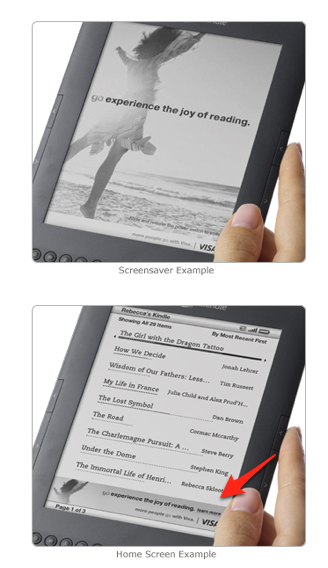 And today’s release obviously lowers the bar even further for people who were on the fence about purchasing an eReader. It’s a smart strategy. Right now we’re in a sort of land-grab for the eReader market, with Google Books, Barnes & Noble’s Nook, and iBooks all duking it out. Amazon has been ahead of the curve, and they’ve done a great job offering Kindle applications across a variety of devices (there’s even a web app). But the books you buy on the Kindle are still laden with DRM, which means they can’t be used on a competitor’s eBook reader. And if Amazon hooks you on the Kindle now with these cheap devices, there’s a good chance you’ll stick with the platform for years to come.